The back garden plot is finally on its way. I hope to get the warm weather vegetables into the soil this weekend, as the cool veggies take the lead. Interspersed with intentional planting are the allowed beneficial weeds: lambsquarter, shepherd’s purse, henbit, dandelion and goatsbeard. These serve to feed the pollinators as the vegetation and flora take their sweet time. The permanent beds are built from a tilled space. I rake trenched the pathways, then covered them with landscape cloth, old rug scraps and thick straw. 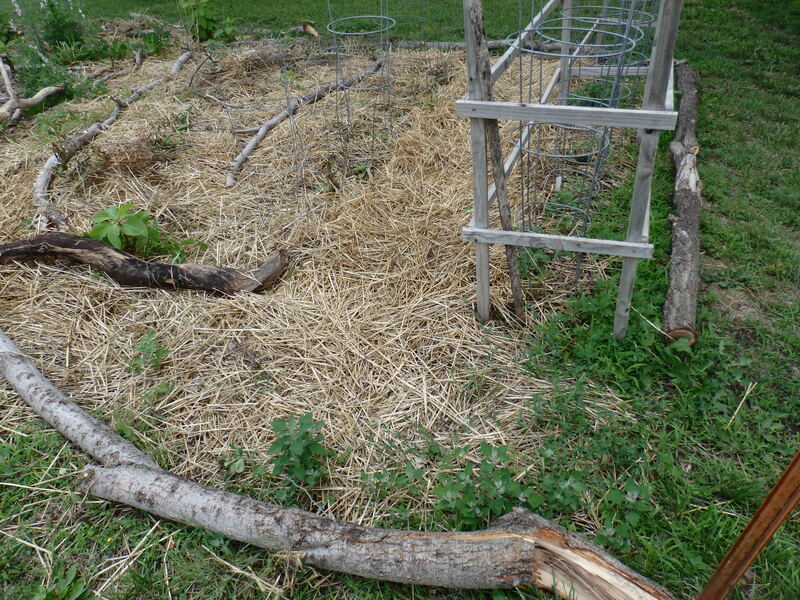 The beds have been lined with materials scavenged from both our yard and the neighboring lots, mostly tree limb scraps. This keeps the beds from being overly compacted, gives me a clean and weed free path, and allows establishment of perennials. I’m hoping that the trenched paths will also provide deep irrigation for the beds, as we’re likely to be in drought conditions again. Edit: The photos below have descriptions, which are best viewed in full format. Simply click on a photo to activate the gallery. Spicy oregano owns this bed, shared with new starts of heirloom peonies. I’ve also placed a few beets on the end, pending germination. This is a narrow row, and is pending soil warmth for pole bean planting. I’ve seeded it with chamomile in hopes of establishing some perennials. This row is a section of a new U-shaped bed that I’ve added. I will plant corn and dry beans here, to go with the already placed experimental pumpkin seeds. This row gets the most shade. I plant spinach and parsley here, along with garlic, walking onions and lemon balm. I have two grape vines growing here, with two asparagus plants accompanying. Also growing here are dill and cosmos. This is the early spring excitement row. Cilantro self-seeded and over-wintered extremely well. I’ve interspersed sugar snap and shelling peas, along with carrots. 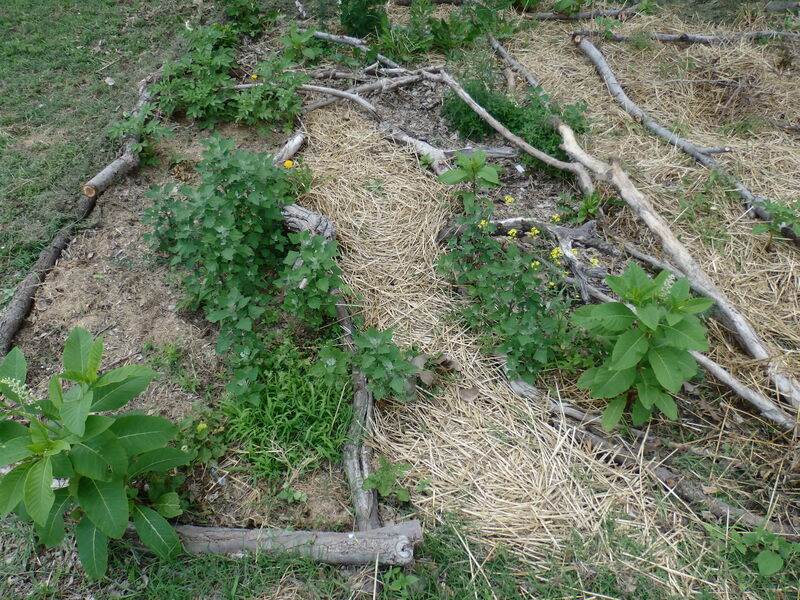 A newly prepared garden bed, this area has beet seeds pending germination, and will serve as the canteloupe ground. Self-seeded cosmos over-winters well and begins a takeover of the grapevine trellis area. This row is awaiting the warmer days so that I can plant cucumber seeds. Next to the cosmos, the area where I’ll plant zinnia. I let it go to seed but have seen no volunteers. These flower areas serve as the ‘front’ of the garden. Strawberries nearly died, as I had ignored the trough over the fall and winter. A few stragglers have appeared, along with a smattering of lettuce from self-sown seeds. The other leg of the U-shaped bed. What a way to work off some winter flab! The broad side of the bean trellis arch. Pole beans will be planted here, as I await germination of marigold and chamomile. 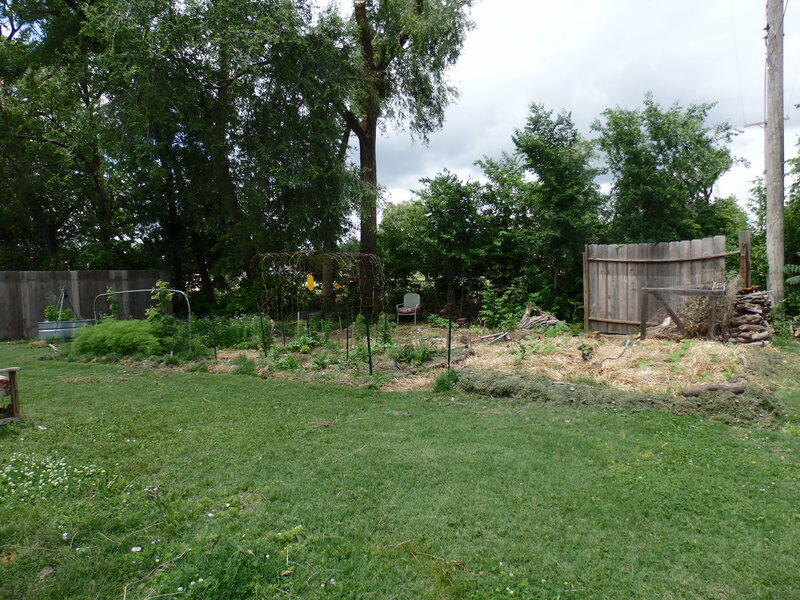 A view of the back garden plot from the back of the ‘compost’bin. Self-seeded lettuce over-wintered well and is the star of the early spring garden. 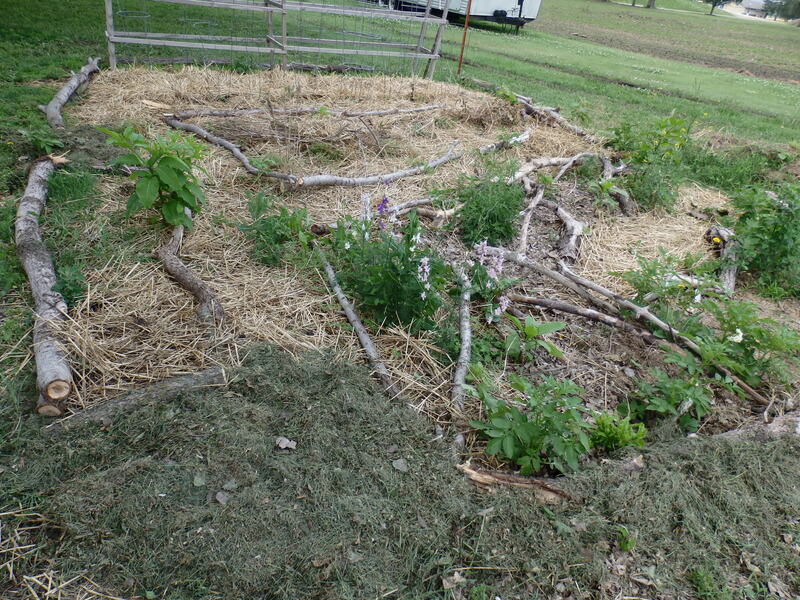 The hugel bed is still transitioning. I’ve got a raspberry bush set atop the mound, and lemon thyme on the south side. I’m still contemplating what will belong here.